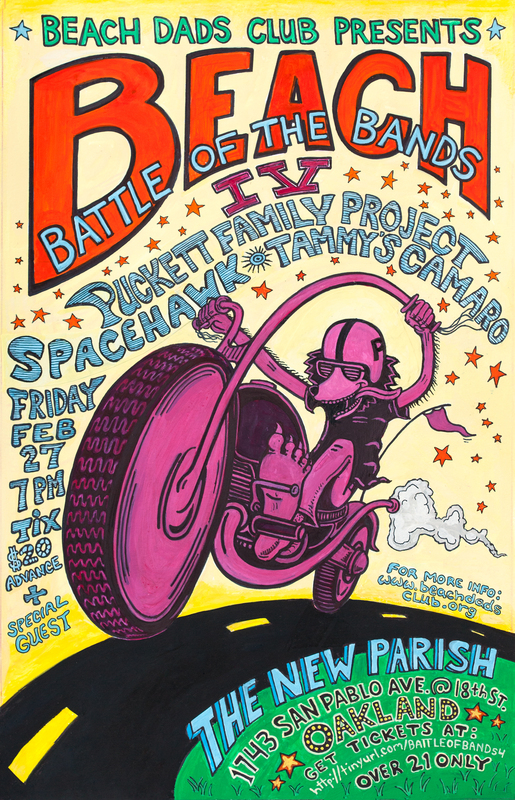 Battle of the Bands is this Friday at the New Parish in Oakland! This is seriously one of the best nights out of the year. It’s low key and high energy with great music showcasing some of the amazing musical talent in our Beach community. Plus, it’s a nice way to hang out with some really fun folks and raise money for Beach Elementary. Doesn’t get much better! This year we have a great range of music. We’ll open with Aaron Fisher, playing a stripped down, energetic acoustic set featuring songs from Fleet Foxes, Bob Dylan, Dan Bern, and The Tallest Man on Earth. Then the Battle begins… The Puckett Family Project, featuring singer/songwriter Tod Puckett, will turn it up this year with a plugged-in, rocking mix of funk and countrified rock originals to get your boogie started. Kirk Markopoulos and Spacehawkith will follow with a set of original, eclectic pop/rock music tinged with everything from 60’s rock to 80’s pop, and ending with Tammy’s Camaro, featuring reigning king, Brian Weiss – a 9 piece band, playing pretty much anything they think is fun and danceable from the 70’s up through today. So, confirm the babysitter! Buy your tickets at tinyurl.com/battleofbands4. See you Friday at The New Parish, 579 18th Street in Oakland.